This is the German-isch meal I had anticipated in the immediately previous post. It was to be an excuse to enjoy a pretty decent riesling, and an all-too-infrequent visit to the food of the Wagner ancestral Heimat. The wine was in fact more than pretty decent, the food as well, and das Kocherei meant more than a little Sehnsucht nach dem Rheinland. ..and this was so much better. 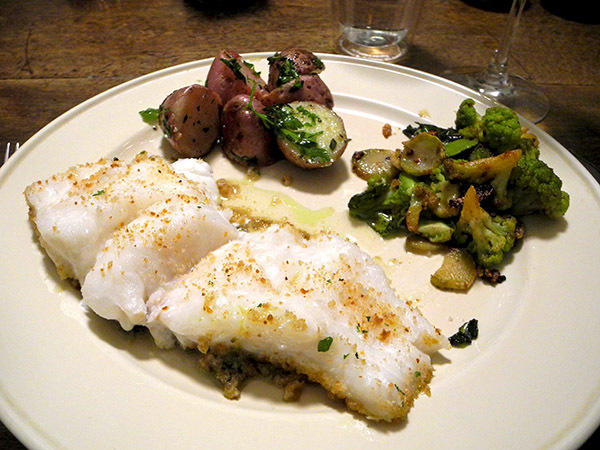 The cod was from Captain Phil himself, whom I had manager to catch at his family’s fish stall in the Union Square Greenmarket where I headed minutes after our train arrived at Grand Central from our wonderful, not-so-very-upstate Thanksgiving break. It was 3:17 when I arrived, pretty late in the day for the market, even for me. I hadn’t gone out looking for seafood, but in pursuit of a vegetable to accompany a dinner of smoked freshwater trout, already resting in the refrigerator. The plan was to enjoy some good German wine on a Saturday evening. I was only going to I say hello to the Karlins and their fish, but then I saw that they still had some gorgeous specimens remaining, and I also spotted the fisherman himself, on one of his rare appearances in the city. I love cod. I bought some cod. I also like cauliflower very much, agreeing with Pliny the Elder, a naturalist, who (before he had died in the eruption of Vesuvius, had also managed to learn a thing or two about seafood, including cod, with which he may have become acquainted through Romano Britain contacts) wrote, “Ex omnibus brassicae generibus suavissima est cyma“/”The most pleasant tasting of all cabbages is the [young cabbage sprout]” I don’t know what I was thinking when, also yesterday, I came across two small, perfect green specimens, perfectly, tenderly embraced by their outer leaves, but only took home one of them. Once I was putting the meal together, I realized that, since our modest table wasn’t inside a fancy boite, even if I included all of the perfectly edible leaves and the upper stem, my little Brassica bud probably wouldn’t be enough vegetable for both of us. Maybe a garnish, but not really a proper ‘side’. My solution was to dip into the paper bags where the boiling potatoes hid out. There weren’t enough red ‘new’ potatoes (which I felt I should sacrifice before they grew into ‘old’), so I added to the pot a few yellowish Kartöffelchen I had picked up that day. 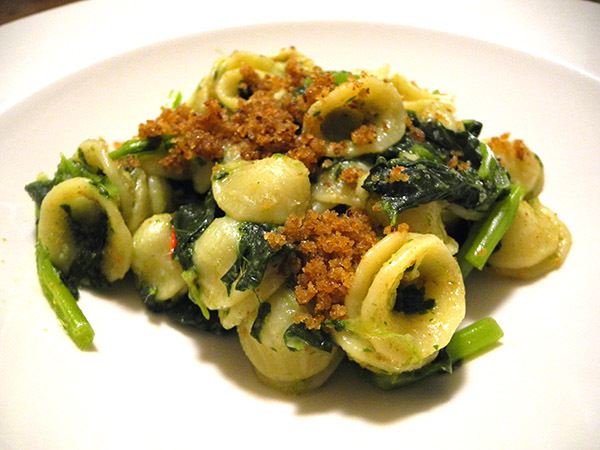 It’s a classic pasta preparation from Puglia, and I’ve prepared it many times, but last night when I began to revisit orecchiette con cime di rapa I had almost forgotten that this particular recipe, which I had started working with with many years ago, calls for fresh bread crumbs rather than dry. Unfortunately, at the time I was reminded of this, because I was looking pretty closely at the printed text of a dish absent for some time from our table, I didn’t have a single fresh crumb in the kitchen. I haven’t been buying bread as often as I used to, so, for the same reason why there was no bread, there were barely enough homemade dry breadcrumbs in the overhead cabinet. The dish works very well with the dry, but fresh crumbs, briefly sautéed like these, would be more fun, just as crunchy, but with a little bounce in the bite. 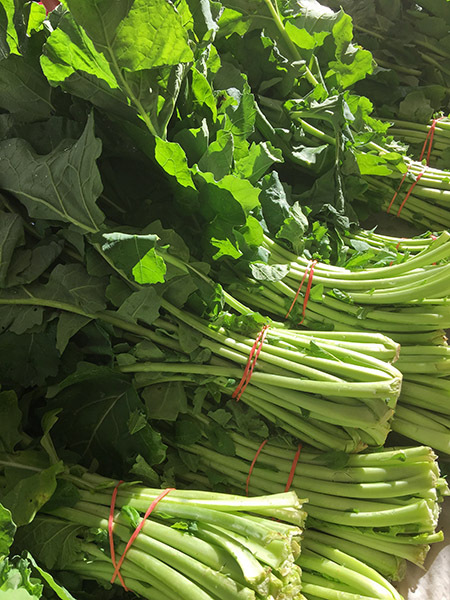 And then there was some excellent cime di rapa. Everything here was at the peak of its flavor, and, since the prep was pretty simple all the way around, I would have found it pretty hard to mess up anything. 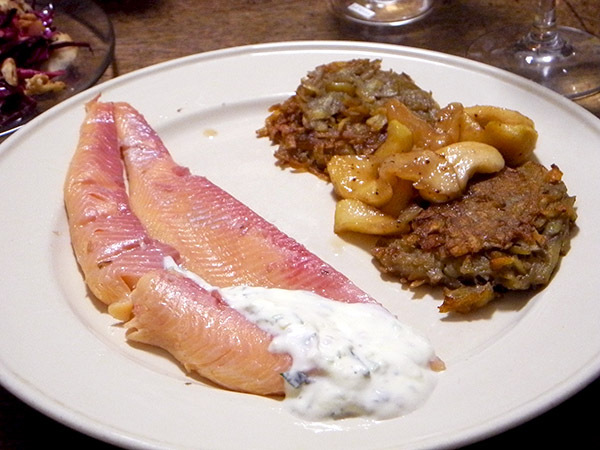 Technically the triad included two cruciferous vegetables, but they were different enough from each other to be treated as two distinct ‘greens’, and they were a terrific accompaniment to the fish. 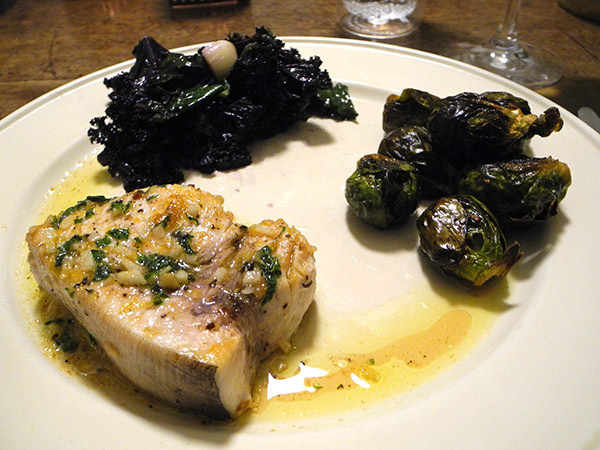 The swordfish steak was buttery, lemony, and herbal, the Brussels sprouts crispy and nutty, and the kale was sweet and almost chewy before it almost melted in the mouth. There wasn’t a great deal of color in this entrée, but I remember that’s pretty much the deal once fall arrives. 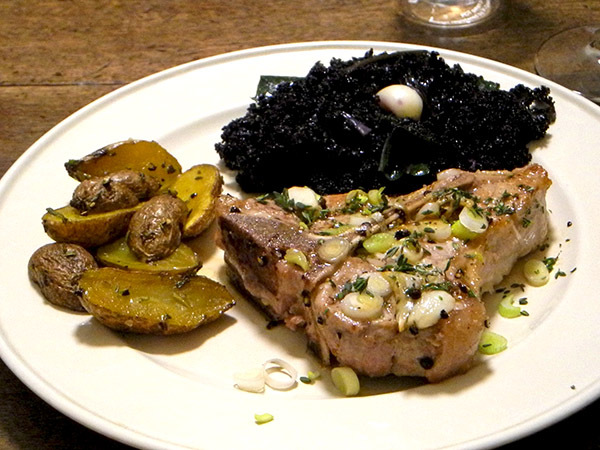 The swordfish recipe came from a ‘Bon Appetit’ in 20015. The treatment of the Brussels sprouts and the kale is my own. the music was a profound performance of Sibelius, Symphony No.4, by the New York Philharmonic conducted by Leonard Bernstein, and it was played twice! I occasionally check out the display case in the Whole Foods meat department when I pass it on the way to goodies at the back of the store that I can’t get at the Greenmarket. The other day a small sign in front of a row of veal chops attracted my attention, especially since I didn’t remember ever seeing veal in the store before. A printed note just below the price said that the meat had come from a ‘Provitello Farms’, in Elba, New York. That was the kind of specific local sourcing I would not have expected from an emporium the size of Whole Foods, so I did some research when I got home, to see what it was about. A few days later I was back. It was a Sunday, I had made no other arrangements for dinner, and I had decided, as an omnivore and someone very conscious of the sources of the food Barry and I consume, to be as reasonable as possible on the subject of veal, meaning, essentially, the morality of its consumption. I was acquainted with all of the arguments on both sides, but my family history, my understanding of the place of a young calf, otherwise useless to any market, in the broader context of domesticated livestock, and my awareness of the huge variations to be found in the treatment of this particular animal, led me back to the meat counter I had investigated earlier in the week. A word on the potatoes. They came from Berried Treasures in the Greenmarket, where they are labelled ‘Pata Chaucha’ (my translation would be ‘new potato’). It was my first full outing with an Andean heirloom variety whose seeds had been given to the farmer, Franca Tantillo, by an Ecuadorean, David, one of the people who works with Dave Tifford of Fantastic Gardens of Long Island. As new potatoes, they might properly have been stored in a cooler place, like the crisper drawer, but last Wednesday I had put them inside a paper bag in my larder. When I pulled them out I noted to myself once again that they would not have won any beauty contests; they might even have aged in those few days. After I had roasted them however I realized beauty was not the story. They were absolutely delicious, incredibly nutty, and with a texture not unlike the very best grilled or roasted eggplant, but juicier. Wonderful.